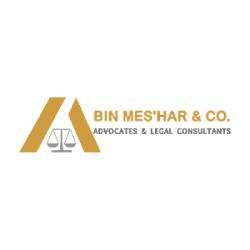 Bin Meshar & CO Advocates & Le ..
We are duly licensed to perform leagal services and advocacy through our offices in Dubai and Abu Dhabi. Our offices is known by its speciality in the fields and laws of commercial, civil and criminal laws company. This Business Centre - Business Village is strategically located at the heart of Dubai’s Central Business and Financial District opposite the all time city landmark Clock Tower.